I am thinking of putting on a cooking class on holiday cocktails. What do you think? It is not-too-distant in my future to host cooking classes. No worries. Before I start promoting classes, I will ask for emails so you can all sign up for a newsletter. THEN you will know what classes are happening when. But for now: a paltry substitute with personality reaching only from my fingertips to your eyeballs, will have to suffice. So be it. Its not like you should have to wait for holiday-cocktail inspiration. Especially since the holidays are upon us. 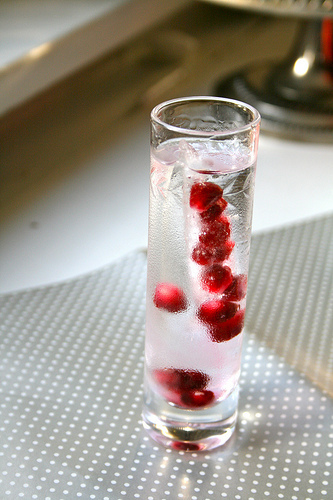 I recently played around with pomegranate juice---the new darling of food trends. (And hats off to their marketing dept. who 'easily' grabbed my attn. with 2 boxes of pomegranates). You know this, right? Ginger syrup: 1 cup water, 1 cup sugar. Simmer to dissolve sugar. Remove from heat; pop in 2 inches of skinned, sliced ginger and let steep/cool. Store in fridge for a few weeks. The best! note: see picture. Do you see the pomegranate seeds? I froze them in those 'water-bottle ready' ice cubes. Works brilliant for vodka shot glasses. Dropping Rosemary Pombs.Because I love herbs... and they rock cocktails. Note: make rosemary syrpup the same way I made the ginger, but with a big pile of rosemary (rosemary syrup added to your basic lemon drops is amazing!). Here is my Christmas Kazi that I created years ago; it was featured on Food & Wine's Home page. Mummy Juice landed itself in a bonafide cookbook---released just last month. No rum? Make it with vodka and skip the soda. I make sangria year round, sliced up seasonal fruit varies. Everyone loves a good sangria. It keeps things interesting. If you never make another recipe on this blog... at least make the eggnog. Really. Trust me. This is STILL my go-to drink. We all have them. What is yours?